Republican Tax Bill Delayed Until Thursday A House GOP bill to rewrite the tax code was going to be released on Wednesday, and is now expected on Thursday. The holdup could threaten plans to get it signed into law by year's end. House Speaker Paul Ryan, R-Wis., announces the outlines of a GOP overhaul of the tax code in September. The full bill's release is being delayed to Thursday. The bill was supposed to be unveiled on Wednesday, but House Ways and Means Committee Chairman Kevin Brady, R-Texas, announced in a statement, "In consultation with President Trump and our leadership team, we have decided to release the bill text on Thursday." Republicans have promised that their legislation will slash taxes for businesses and individuals, simplify the complicated tax code and spur major economic growth. President Trump called on Congress to finalize the bill by Christmas. "I want the House to pass a bill by Thanksgiving," Trump said during a meeting with business leaders at the White House on Tuesday. "I want all of the people standing by my side when we get ready to sign by Christmas." House Speaker Paul D. Ryan, R-Wis., later agreed with Trump, saying that the two were "linked" on the plan. "We are ready," Ryan said. "We are excited, we're moving." Brady told reporters that staff would continue working through the night to negotiate the remaining sticking points, and his statement said that the schedule for his committee to begin its markup of the bill next Monday was still on. Ryan and other leaders hope the tax bill will be the best chance the Republican-held Congress has to enact one of Trump's key policy proposals. The legislation is expected fill in the gaps left by an earlier outline that promised to lower the top corporate tax rate from 35 percent to 20 percent, trim the top individual tax rate from 39.6 percent to 35 percent and slash taxes the rate for small businesses to 25 percent. That outline left out how much it might cost to make those low rates possible and what existing tax breaks would be eliminated to help off-set the expense. Republicans struggled in recent weeks to decide which breaks to eliminate and members were still at odds over fears that the plan could raise taxes on some middle class families in high-cost of living states. House Ways and Means Committee Chairman Kevin Brady, R-Texas, told reporters that members of his committee were still working to finalize the details. He also would not rule out making additional changes once the bill is released on Thursday. "We'll continue on listening mode," Brady told reporters. "Stay tuned." Among the most controversial measures was a plan to reduce amount of money taxpayers could set aside for retirement in 401(k) plans without being taxed. Brady has explored a number of options, including making it easier for taxpayers to utilize other retirement accounts, but many members and outside groups have worried that the plan would gut the widely-popular savings incentives. "Any changes we make are going to strengthen retirement," Brady said. There has also been widespread disagreement with the GOP over plans to make it harder for most families to claim popular itemized deductions, like a credit for mortgage interest. Republican leaders say their plan would reduce tax burden for most families by doubling the standard deduction from $12,000 for individuals to $24,000 for families and increasing the per-child tax credit. A higher standard deduction would be easier for most families, but homeowners and people who live in expensive cities and states who would normally itemize their deductions could pay more. Republicans have also considered lowering the cap on which mortgages would be eligible for the deduction and eliminating a deduction for taxes already paid to state and local governments. GOP lawmakers from New York and New Jersey have been particularly vocal about those concerns. Republican leaders have suggested that the plan would keep an existing deduction for property taxes, but Brady said Tuesday that negotiations over state and local tax breaks were still ongoing. Many members also worry that leaders have not said which tax rates would apply to which tax payers. 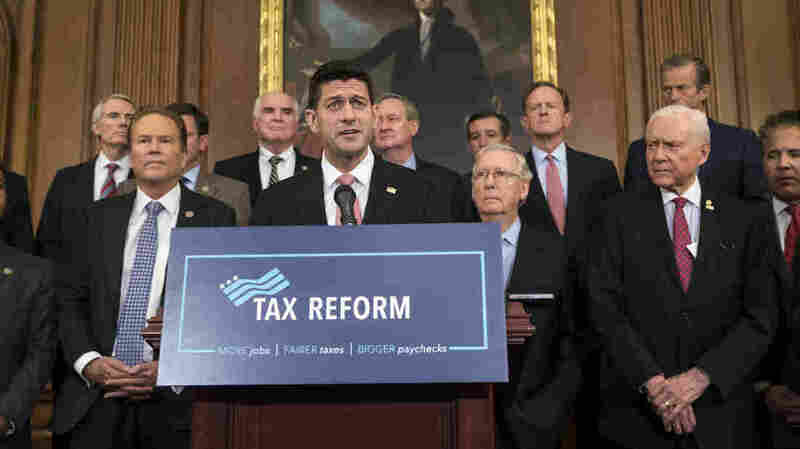 Republican want to trim the existing seven tax brackets to just three or four with rates of 12 percent, 25 percent, 35 percent and a possible higher rate for top earners. But Brady was unwilling to say which taxpayers would fall into which bracket or whether there would be an extra tax for the very-rich. Despite the uncertainty, Brady had said earlier on Tuesday the GOP plan was still on track. "Our plan is to move forward on the current timetable," Brady said. "We certainly are listening very carefully to make sure we are delivering tax relief." Minutes before putting out a statement announcing that the bill would be delayed until Thursday, Brady told reporters that staff were working through the night to keep the bill on schedule.